It is very effective magnetic separator of our offered range. 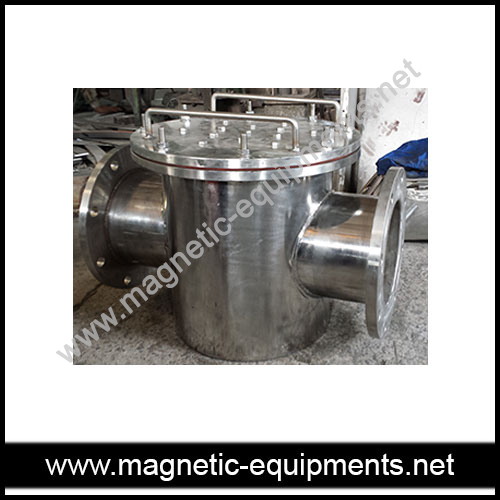 Pipe line magnetic separator is specially designed for the liquid and semi liquid material. It is used for the different kinds of pipe line systems. Our pipe line magnetic separators are efficiently used for the slurries and abrasive liquids. Pipe line magnetic separator contains a magnet cage which is fixed in the tube. Tube contains input and output connection to pass the fluid.Magnetic cage capture ferrous contaminants from the flow. Contaminant free flow is necessary for the system to lessen the damage to the system.It is also necessary for the proper function of the system. It is used to prevent damage to the systems like filters, refiners, mixers and pumps. It is very easy to put off for cleaning. Magnetic cage is subject to wash in order to clean it. It is also easy to reinstall.